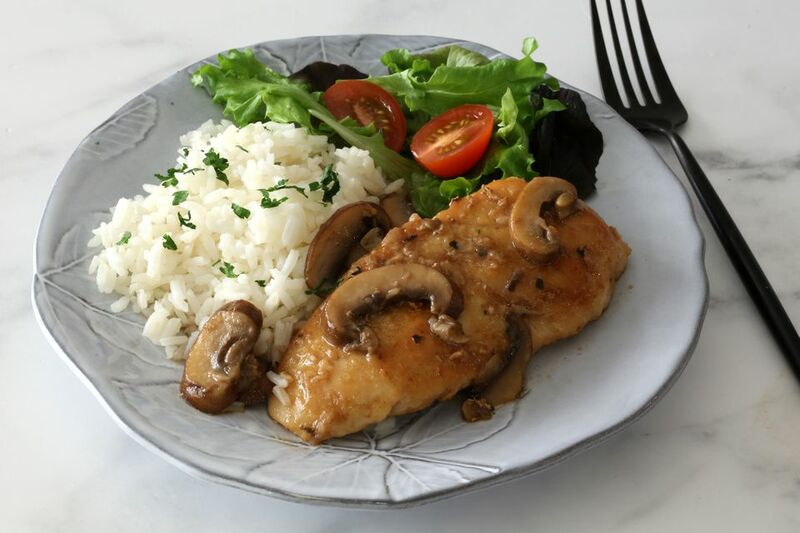 Chicken Marsala is a simple Italian American dish made with chicken breasts, mushrooms, and Marsala wine. The dish takes less than 30 minutes to prepare and cook, making it an excellent choice for a busy day dinner. This chicken Marsala is purportedly similar to the dish from Olive Garden Restaurants. This version calls for dry Marsala wine, but if you prefer a slightly sweet flavor in the dish, use a sweet Marsala. The cooking time depends on the thickness of the chicken breasts, so take care not to overcook them. This is one of the easiest skillet chicken dishes, and one of the tastiest. Serve chicken Marsala with hot cooked angel hair pasta or spaghetti, or serve it with roasted potatoes or rice. Put a chicken breast between two sheets of plastic wrap or place it in a food storage bag. Pound gently to thin to a uniform thickness. Repeat with the remaining chicken breasts. Alternatively, if the chicken breasts are very thick, slice them in half horizontally to make thinner cutlets. Melt 2 tablespoons of butter with the olive oil in a skillet over medium heat. Combine flour, 1/2 teaspoon salt, pepper, and oregano; blend thoroughly. Dip the chicken pieces in the flour mixture to coat and place them in the hot pan. Cook the chicken over medium heat for about 3 to 4 minutes on one side, or until it is lightly browned. As you turn the chicken breasts to the second side to cook, add the mushrooms around the chicken pieces. Add more butter, if necessary. Cook for about 2 more minutes, until lightly browned on the second side. Stir the mushrooms. When the second side is lightly browned, remove any excess fat and add the wine around the chicken pieces; cover the pan and simmer for about 5 to 10 minutes, or until the chicken is done. Remove the chicken from the pan and simmer, uncovered, for 2 to 3 minutes longer to reduce the wine. Taste and add salt, as needed. Serve the chicken breasts with rice, pasta, or potatoes. A serving of chicken (cooked) is about 4 ounces or the size of a deck of cards. The chicken will shrink somewhat on cooking, so purchase about 5 to 6 ounces of raw boneless chicken for each adult you are feeding. Children, however, will need less chicken. Count on about 1 ounce of cooked chicken for children from 1 to 6, or 2 to 3 ounces for children from 7 to 10. To avoid overcooking the chicken breasts, check them with an instant-read thermometer inserted into the thickest pieces. The USDA recommended minimum safe temperature for chicken is 165 F.
For a lighter sauce with less alcohol, replace some of the Marsala wine with unsalted or low sodium chicken stock. For a saucier dish, add some cream to the sauce just before it is ready.